If you are a warehouse manager that walked the floor at the materials handling show Promat in the spring of 2017, you may have noticed the number of vendors touting lithium ion batteries for forklifts. The technology is relatively new for forklifts, and yet there are many questions warehouse managers are asking about their use in a warehouse application. Note: The answers in this post on lithium ion batteries in forklift applications are being worked on so this document will change and grow over time. What are the advantages of a lithium ion batteries for forklifts in warehouse applications? Because a lithium-ion forklift body is two feet shorter than a lead-acid body, an operator can work in tighter places. This is very handy for loading trucks and operating in narrow aisles. Less heat is generated during charging and discharging. Better rear lift truck visibility because the battery is smaller. Li batteries are lighter (also a perceived disadvantage, see below). They are longer lasting. More than 100% more life, claims Kalmar. They charge faster than lead acid batteries. An LiB can absorbs 50% of its capacity from a boost charge time of just 30 to 40 minutes. After 80 minutes an LiB can reach full charge status. Boost charging makes it possible to use LiB equipped lift trucks for up to 24 hours a day, 7 days a week without changing batteries. LiBs have higher energy efficiency and eliminate the need for a battery change after three shifts. Lithium-ion, and in particular Lithium Iron Phosphate (LiFePO4) is particularly good when it comes to industrial battery use. LiBs last five times longer than lead acid, batteries. Also, LiBs don’t have the voltage sag that lead acid batteries suffer from. They give a full charge until exhausted. They do not have no sulfation issues, or safety issues with out gassing. So ventilation systems are not necessary in charging areas. Over the lifetime of the battery, it costs less relative the the alternative. What are the disadvantages of lithium ion batteries for forklifts in warehouse applications? Li batteries are lighter and because the weight of a lead acid battery acts as a counter weight on a forklift, anyone offering an LiB on a forklift has to compensate for the lost weight in the design of the truck or battery casing. Forklifts can be designed around this shortcoming and additional counter weights can be added. The battery requires a management system. Lead-acid batteries are dumb, but that’s ok. LiBs will become damaged if they don’t have a management system on it. This added complexity means there are more potential problems, and opportunities to damage the battery. Because of the newer technology there are less options for recycling at the end of life. That said, over time better and cheaper recycling options will become available. From an energy perspective, Li-ion is about four times lighter than lead-acid batteries, but it will cost about six to seven times more (data from mid 2016), but prices are dropping fairly quickly. Cost is still a factor relative to lead acid battery technologies, however it is dropping by half each year and should be the same or cheaper than lead acid technology by 2020. What are the different types of lithium ion battery (LiB) and how do they differ? Lithium ion comprises a whole range of chemistries, ranging from LiCoO2 to LiFePO4. 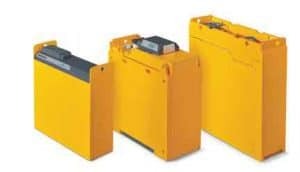 The phosphate battery, which is used in industrial applications such as forklifts, is not dangerous; it’s thermal stability and ability to handle abuse is quite similar to gel lead acid batteries. There are many lithium-based battery chemistries: See the heading: “Chemistries” on this Wikipedia page: Lithium battery. Are lithium ion batteries safe in warehouse applications? The short answer to this is: Yes, they are safe. And safer than lead acid batteries. The versions used in forklifts are even safer than the version used in cellphones. See this article for a good discussion on lithium ion battery safety. Which forklift manufacturers have lithium ion battery options? Kalmar offers an ECG forklift truck with Lithium-ion battery. See video. Which Li batteries are endorsed by which lift truck manufacturers? Which Lithium Ion batteries are UL approved? What are the dangers of lithium Ion batteries? What is the recycling method for Lithium Ion Batteries and how environmentally friendly are they vs. lead acid?